Flowers for the Bride - Not Flowers at all! 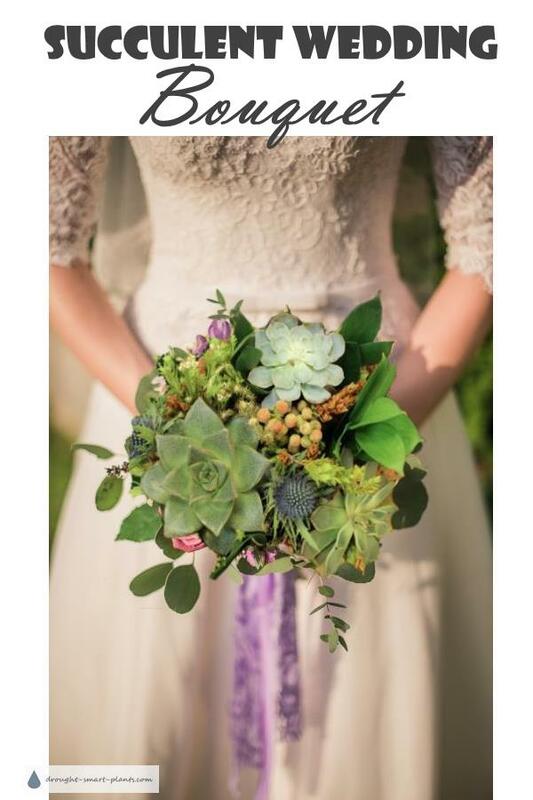 The latest buzz is using succulent plants for your bridal flowers. A succulent wedding bouquet can offset the big expense of the brides’ bouquet by using commonly grown succulent plants such as Echeveria, Pachyveria and Sedum. Don't think that just because this is economical that these wedding flowers won't be beautiful - they're gorgeous and intriguing, and easy to care for! The combination of rosette forming succulents along with Paxistima (Oregon boxwood) and ferny greens, Gypsophila (babies breath) and other frothy types of dried flowers or cut flowers can be exceptionally beautiful. Typically, wedding bouquets of all kinds have backgrounds of greens like eucalyptus leaves - and there's no need to leave out whatever other kinds of greens you can collect from your garden, or that the florist has in stock. Hardy succulents such as Sedum, Sempervivum and Jovibarba can be used too - treat them as roughly as you like, they won't mind. Afterwards, plant them into a dry and sandy place in your garden, and they'll be a permanent reminder of your special day. With the interest in using succulents in wedding bouquets, centerpieces and wedding favors, you won’t have any problem finding some of these gorgeous plants that resemble flowers for your succulent wedding bouquet. A large overgrown specimen requiring a heavy pruning is perfect for this project. Cut the stems as long as possible so you can make the handle, or use picks or skewers. 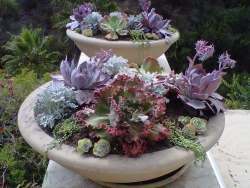 It’s not necessary to use water filled picks, as succulents have the ability to survive long periods of time without water. This makes it possible to make the succulent brides bouquet up ahead, with only the addition of filler plants and flowers to do in the final few hours. Do not refrigerate your bouquet or any other succulent wedding flowers, as this will damage them. They’ll be quite happy in a warm brightly lit room until the day of the wedding ceremony – Unlike most cut flowers they will last very well for up to a week in the right conditions. After the big day, the succulents can be detached from the bouquet and rooted to give you an everlasting memento of the happy occasion. For a full out succulent wedding you can also make succulent wedding favors and place markers, as well as boutonnieres for the groom and his men and gorgeous centerpieces made from succulents for your wedding flowers. As in the case of a green roof wedding, confetti made of the leaves of Sedum have been used too, and will root in place to make a permanent reminder. See more beautiful wedding bouquets and succulent wedding flowers in the Succulent Wedding Gallery.